When I was invited to try out the latest additions to the Cocktail and Food menus at one of newcastle’s newest bar offerings; The Botanist, I just couldn’t refuse. After all this bar has had one of the most successful launches the City has seen in recent years and recently launched a Roof Garden off the back of that success, just in time for Summer. 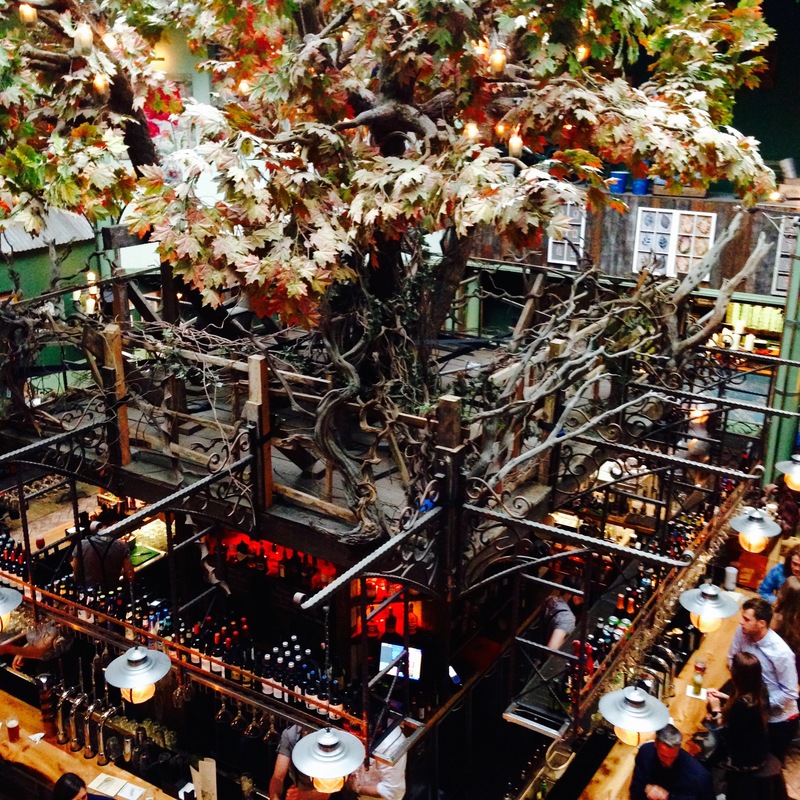 If you’re not familiar with The Botanist, first of all, where have you been?! And secondly, it’s pretty hard to miss given the presence the chain commands on social media. The bar / restaurant occupies the very top section of the old Monument Mall space at the Monument area of Newcastle and is visible from Dean Street. Access is via a pretty understated entrance next door to Jamie’s Italian and begin your ascent up the darkened staircase. Once at the top, the huge space opens out into what feels like a gigantic botanical garden. The centrepiece for the bar is a gorgeous twisted old tree decorated with lights and hanging jars, the bar itself is actually built around the tree trunk. It’s a real destination bar and well worth a visit for anyone who is visiting, or currently living in the glorious North East, even if just for the amazing photo opp. With the weather looking awful I abandoned my plan to wear a suede frock and threw on a Zara shirt and pants with a pair of classic Manolos and off I went. I was invited as part of an intimate Bloggers event, the Food, Cocktail and Ale menus have recently been overhauled and there are some new additions that required testing – all in the name of work of course! A small but mighty four of us descended on The Botanist last night and were very well looked after by a hip young bar tender. We were taken through the new menus and then the onslaught of fine food and drink began. We were served light bites, perfect for sharing, including: Salt and Pepper Pork Crackling, Baked Camembert with Onion and Rosemary, Goats Cheese and Tomato Quiche, Onion Petals, Shrimp Cocktail and Sardines, served in a retro sardine tin, all of which were divine. The Onion Petals – a more petite version of the original Ruby Tuesdays Blooming Onion, are to die for and you’ll be pleased to know that they’re cooked to perfection so there’s no unpleasant onion breath afterwards, perfect for date night! The Quiche was amazing, I’m not usually a lover of quiche but this was perfection, and incredibly light too. The Cocktail menu boasts four new cocktails; Pornstar Martini with champagne chaser, Watermelon and Sage Sling, Passion Fruit and Basil Crush and an Apricot and Ginger Sling. Now you may think a cocktail is a cocktail and after a few they all taste the same but with The Botanist, things area little different. The Team have added these based on the change in season and each is light and fresh, think Summer in a glass. The Passion Fruit and Basil Crush is a taste sensation, packed to the rafters with flavour, it’s a Summer dream and an absolute must try. Same goes for the Apricot and Ginger Sling, aesthetically gorgeous and packed with flavour, it’s a real Summer drink and is very moreish. The Watermelon and Sage Sling is a long and dangerous drink, it’s so thirst quenching and it tastes alcohol free (it’s not) – beware! The Pornstar Martini is a short drink served in a traditional martini glass, thick and creamy exactly as it should be and delicious. Whilst we dined and chatted, we were treated to the soulful sounds of Hattie Murdoch, a singer / songwriter from the North East who played an acoustic cover set with some awesome and unexpected tracks thrown in. I’d highly recommend you check her out at one of her many performances across Newcastle, she’s completely aces. If you’re looking for a bar where you can settle in for the night, you’ve found it in The Botanist. Take in a few light bites from the new menu, swig a few cocktails and absorb the sounds of the live music, what’s not to love? So, huge thanks to The Botanist Newcastle for looking after us all night and to the amazing gals who also attended for making it such great fun, I’m game for Round Two if you are…. ?